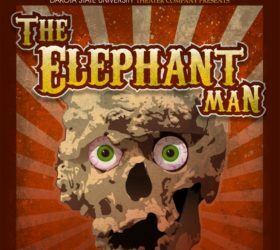 This weekend, March 15-18, DSU Theater Company performed the play, “The Elephant Man” which teaches valuable lessons about kindness. On Saturday, March 17, the third day of the performance, I attended, not knowing exactly what to expect. Let me tell you, I was not disappointed. The play seemed to start right as I walked through the doors. Upon entering, I was greeted by the setting of a freak show. While waiting in line, one of the cast members handed out special tickets to enjoy this freak show which included many unique characters such as: a strong man, Siamese twins, a man-eating chicken, and much more. Seating in the playhouse was not anything like an average play. It was was split into three sections, all of which surrounded the center of the stage which was decorated to look like a big top tent, a fitting setting for the circus theme. The play itself contained plenty of enjoyable humor as well as brought up some great life questions. The actors and actresses each played their role well, especially the actor playing the role of John Merrick (The Elephant Man), Ryan Marnette. Marnette was able to contort his body like The Elephant Man without any major costume props. The only gripe I had with the play concerned a curtain used as a prop in the middle of the stage, which created a slight problem from where I was sitting. If the actors and actresses were positioned in a specific spot, the curtain blocked the view of the action. Though, this was only a problem for the first couple scenes, and after that, the curtain never showed up again. Overall, the performance was very immersive with the way it expanded beyond the stage and the play itself, making it much more enjoyable, entertaining, and definitely worth attending.